Two battery-powered heavy vehicles developed in and for Hong Kong are about to hit the roads to help reduce the city’s notorious roadside emissions and noise pollution. The two prototypes – a 53-seater coach and a 16-tonne truck – were on display for the first time at the 12th Eco Expo Asia, which opened on Thursday at AsiaWorld-Expo on Lantau Island. They could potentially join the variety of electric vehicles on Hong Kong’s roads, most of which are private cars – 10,361, compared to 231 others such as taxis, buses, minibuses and light goods vehicles. 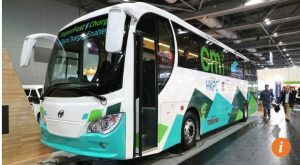 In a first for Hong Kong, the 12-metre passenger coach was designed, developed and assembled in the city by Green Mobility Innovations, the only certified local carmaker to date. 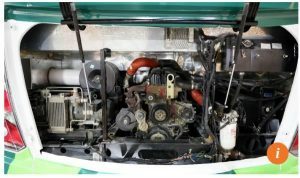 To overcome the range limit of battery power – 40km on a full charge – a diesel generator was added to recharge the battery on the go. The firm’s managing director, Lo Chee-pui, said the generator runs for one-third of the time that the vehicle is running, drastically reducing emissions. The lithium-titanate battery, meanwhile, is designed for more than 10,000 charges. “I’m sure the battery will still be running strong by the time the vehicle retires in 15 years,” Lo said. While the coach’s development cost $HK9.5 million – half of which came from the government’s Innovation and Technology matching fund – Lo said the vehicle should have a price tag of about HK$3 million, roughly 30 per cent more expensive than its diesel variant.